Hidden New Jersey has taken real or virtual visits to a lot of New Jersey airfields and historical aviation sites like Hadley Field in South Plainfield, Doolittle’s Landing in Boonton, Greenwood Lake and even the old passenger terminal at Newark Liberty International Airport. Through those visits and subsequent research, we’ve learned just how common airfields once were in New Jersey communities, and how many we’ve lost to time and real estate development pressures. Granted, with the increase in commercial air flight, the skies are a lot more crowded than they were in the heyday of these small airstrips, but some aviation fields are still thriving. Some of the key smaller airports, like Teterboro, Morristown, Princeton and Caldwell/Essex County have evolved to handle corporate jets and the like. They’re an alternative to the major airports, especially for bigwigs who can afford to rent a private jet or own a propeller plane of their own. Then there are the general aviation fields like Lincoln Park, which have remained largely middle-class in demeanor, with no fancy aircraft or equipment around. Those are the places that really hark back to the days when all a fixed-base operator (FBO) really needed was a wind sock, a level field and someplace to gas up the plane. Standing on the grounds, you can easily imagine that the next plane to land might be piloted by Charles Lindbergh or Wiley Post, returning from a leisurely flight over the Jersey countryside. Back in the day, one could never know who just might be running the place. She might be an accomplished military pilot like Marjorie Gray, or, in the case of Lincoln Park, Amelia Earhart's mechanic Ed Gorski. Actually, to simply say that Gorski worked with Earhart is ignoring his much more eventful career, in which he had a hand in the construction or maintenance of several airplanes that would later make history. He was among the first mechanics to work at what would become Teterboro Airport, helping famed aviator Clarence Chamberlin construct surplus World War I airplanes. Later, while working for Atlantic Aircraft Corp., he worked on the plane Commander Byrd flew over the North Pole, and the Fokker Friendship in which Amelia Earhart flew as the first woman to cross the Atlantic by air. He was also on the crew that built the first airplane to fly from an aircraft deck in what was envisioned as ship-to-shore airmail. Gorski reconnected with Earhart in 1932, as she prepared to become the first woman to pilot an airplane across the Atlantic. Working with another mechanic, he reinforced Earhart's Lockheed Vega to withstand the rigors of the extended flight time and added weight of the extra fuel the craft would be required to carry. To test their handiwork, Gorski and the other mechanic logged several consecutive hours of flight time over the Meadowlands, loading the Vega with sandbags to simulate the weight of the fuel it would require for the crossing. When they were ready to return to the airport, they'd drop the sandbags where Giants Stadium now stands, leading a few observers to believe the marsh was being bombed. 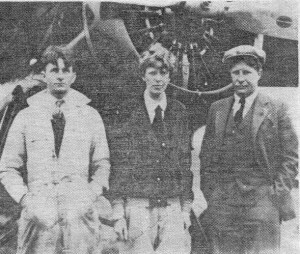 Gorski also accompanied Earhart to her departure site in Newfoundland to make any last minute adjustments before her historic flight. Following his stint with Earhart's Vega, Gorski opened an FBO operation at Teterboro with his new wife Julia. Together they made a living during the depths of the Depression, providing flight lessons, running sight-seeing flights to Hackensack and back, selling airplanes and operating an aerial photography business, among other ventures. After the United States entered World War II, they moved the business to Warwick, NY and continued training pilots until Ed joined the Air Corps. Julia kept the business going as Ed flew in the Pacific theater, though wartime shortages eventually forced her to close up shop. The Gorskis returned to New Jersey after the war, purchasing the Lincoln Park Airport in 1946. He might not have continued to make aviation history, but in many respects, Ed did much more. From all accounts, he and Julia ran a tight operation with little tolerance for cutting corners or bending the rules. In my research, I found fond remembrances from several former employees and people who'd flown in and out of Lincoln Park, recounting the lessons Ed taught them, and how he made them better, more disciplined pilots. Many mentioned his unassuming nature and their own amazement that this down-to-earth man had worked with so many aviation greats. Both Ed and Julia were named to the New Jersey Aviation Hall of Fame in the 1970s; Ed as part of the inaugural class which included Lindbergh, Earhart and Chamberlin. While the Gorskis retired in 1979, Lincoln Park Airport continues to attract regular traffic and appears well maintained. Unlike so many of New Jersey's other historic airfields, it seems that Ed Gorski's old field will continue to welcome flyers for quite some time. Great piece. Thanks for the research. Who knew little Lincoln Park airport has such history? Thanks, Daryl! It was a lot of fun to discover the "six degrees" aspect of the airport, and I'm glad you enjoyed the story. I loved your May 23rd 2013 article about Ed Gorski. He was truly one of the great ones. He did indeed run a tight ship, which is probably why my Dad moved his plane from Teterboro to this little grass strip in Lincoln Park. I spent a great deal of my childhood at these two airports, not to mention my uncle George’s seaplane base in Little Ferry, plus there was a small airport that we use to visit in Mahwah before the Ford Assembly Plant replaced it. However, Lincoln Park was our main venue, and it’s where my Dad, Tony Farell, Harold Buckley and a few others taught me to fly. There is much that I could say about Gorski and his wife Julie, but one thing that stands out in my mind is a freak windstorm that nearly destroyed the airport one winter. It lifted the tie-downs off the ground, ripping off their wings, and brought down one of the main hangers, destroying the planes inside. It appeared that this was the end of Gorski’s airport, and that we would have to find a new home for my Dad’s Cessna 195. However, there was Gorski strutting around like General Patton, amid all the destruction, chomping on his cigar, barking out orders like it was all routine, and for him, it was just that – all routine. What a lesson. Thanks so much for sharing your stories with us, Greg. Sounds as if Ed Gorski was the kind of man who didn't let much get in his way! Also, Greg -- I'd love to hear more about the Little Ferry seaplane base, as I haven't been able to locate much information about it. If you'd be willing to share some data, please contact us at hiddennj@gmail.com . Thanks! Greg, I just happened upon this post. My name is Pam, Ed Gorski was my Great Uncle and God Father. Your dad was Tony Farell? He taught me how to fly a Cessna 150 - I logged hundreds of hours (your poor dad) I was scared to solo - never did. Your dad was the nicest man, and he was really thought well of by my Aunt & Uncle. Thank you so much for sharing ! Sue, Thank you for writing the article - it's been wonderful to reminisce! Pam, what a small world I am thinking. Would you be Ed and Jule's little niece (grand nicee) who used to vist regularly with your mom when you were barely a toddler? Darned if I can remember the little girl's real name, Eddie never called her anything except "Buttons". I left the area before you would have been old enough to start taking lessons, but I share a lot of time with Tony as my instructor with you. In fact he gave me my private pilot check ride back in 1965. Time does fly. We might have met in the past and not known it. I lived on Hillview road, across the street from the airport for many years (basically 1950 through 1965). I had a model on the ceiling too. I'll never forget Ed and Jule. Fond memories.